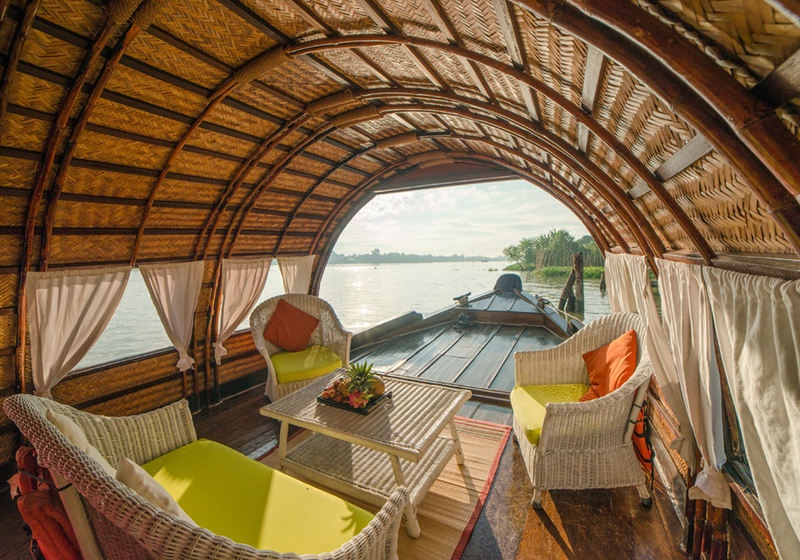 Based on the traditional An Giang fishing boats we are offering you new luxurious houseboats for private and exclusive tours through the Mekong Delta. The vessels, built by local craftsmen, are made of local woods decorated with elegant carvings for a special touch. To provide your safety and well-being, our staff on board (captain, sailor, chef, tour guide) is at your constant disposition. The guest area (40 sqm) has a luxurious cabin (double or twin occupancy) with a French balcony, air-con, a private bathroom, a panoramic lounge with French balconies and a sun deck at the bow. On request, the salon can be changed into an additional bedroom with two beds. The staff area, with a well equipped kitchen, is at the back of the ship. This area is completely separated from the guest area by a lockable door to ensure your privacy. 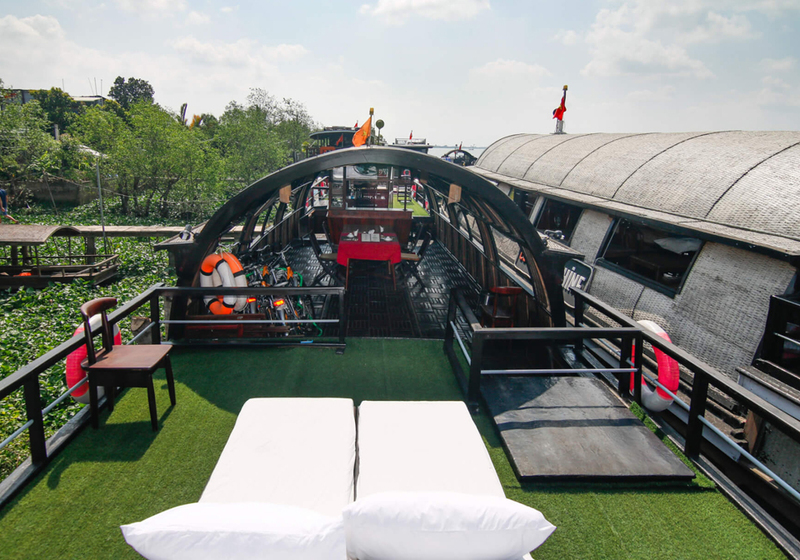 Visit the famous floating markets with the Gecko Eyes, travel through small canals along orchards and floating villages up to the boarder to Cambodia or down to the port cities of Ha Tien or Rach Gia. Due to its shallow draft, the Gecko Eyes is able to glide through small tributaries and canals of the Mekong Delta. The sailing area is from My Tho and Cai Be, near Saigon, through the lovely colonial town of Sa Dec, along Can Tho with its famous floating markets to Long Xuyen an Chau Doc near the Cambodian border. Basically, the Gecko Eyes has the whole Mekong delta region at its disposal, as the ships are self-sufficient for several days. There are always bikes on board for spontaneous trips on the river islands along the small canals. An electrical generator provides an on-board electricity supply of 220V and a battery pack ensures a quite night. Modern on-board waste-water treatment and solar hot water boilers reduce the environmental impact of our boats. Modern safety equipment (heat and smoke detectors and firefighting system) a total of six separate compartments and a regular emergency training of the staff ensures the safety of the guests. The actual itinerary can slightly be changed. Actual itinerary will be confirmed when the tour is booked. Side trips on sampans as mentioned in the itinerary. 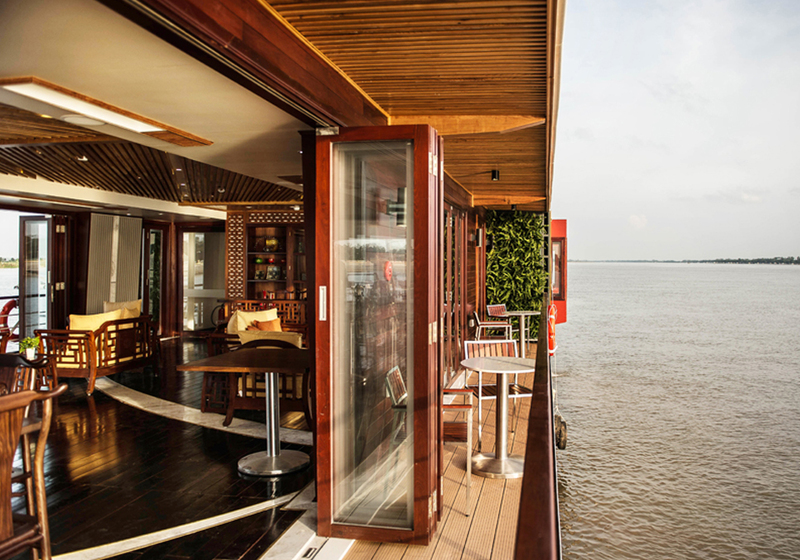 10:30: Return to the boat and cruise toward Can Tho with lunch on board. Transfer by shuttle bus to Rach Gia and ferry from Rach Gia to Phu Quoc. 10:30 : Return to the boat and cruise toward Can Tho with lunch on board. 07:00: Departure of speed boat to Phnom Penh. 17:00: Return to the boat for refreshment and to enjoy the sunset on deck. 08:30: Visit to floating fish farm and Cham village. 10:00 : Return to the boat for brunch. Free of charge for one child (under 6 years old) sharing cabin with 02 adults, the second child applies 50% of adult rate. Child from 6 – 12 years old applies 50% of adult rate.